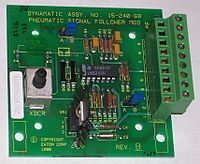 Analog electronic circuits are those in which current or voltage may vary continuously with time to correspond to the information being represented. Analog circuitry is constructed from two fundamental building blocks: series and parallel circuits. In a series circuit, the same current passes through a series of components. A string of Christmas lights is a good example of a series circuit: if one goes out, they all do. In a parallel circuit, all the components are connected to the same voltage, and the current divides between the various components according to their resistance. When the circuit size is comparable to a wavelength of the relevant signal frequency, a more sophisticated approach must be used, the distributed element model. Wires are treated as transmission lines, with nominally constant characteristic impedance, and the impedances at the start and end determine transmitted and reflected waves on the line. 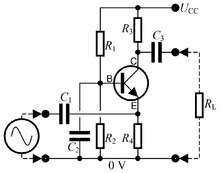 Circuits designed according to this approach are distributed element circuits. 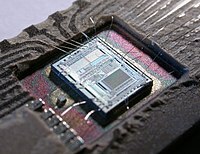 Such considerations typically become important for circuit boards at frequencies above a GHz; integrated circuits are smaller and can be treated as lumped elements for frequencies less than 10GHz or so. ^ Charles Alexander and Matthew Sadiku (2004). "Fundamentals of Electric Circuits". McGraw-Hill. ^ Richard Jaeger (1997). "Microelectronic Circuit Design". McGraw-Hill. ^ John Hayes (1993). "Introduction to Digital Logic Design". Addison Wesley. This page was last edited on 28 March 2019, at 12:03 (UTC).